In Syrtis Major, THEMIS mapped the largest known exposure of olivine-rich rocks on Mars. Because olivine decomposes easily when wet, its survival from ancient times suggests Mars has been cold and dry for much of its history. 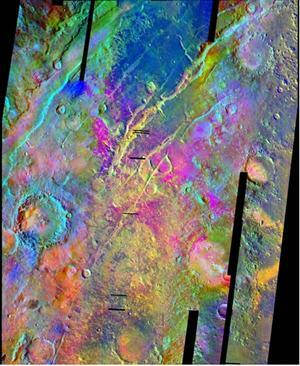 Multi-spectral infrared images by the Thermal Emission Imaging System (THEMIS) on the Mars Odyssey spacecraft have mapped the distribution of olivine-rich materials on Mars. Olivine is a common green volcanic mineral that breaks down rapidly in contact with water. THEMIS images provide geologic context for these materials, first identified by Mars Global Surveyor's Thermal Emission Spectrometer (TES) instrument. In one location in Nili Fossae, part of Syrtis Major, a variety of evidence - spectral, thermal, visual, and topographic - shows large exposures of olivine-rich material. Most of this occurs in layered units of bedrock. These units - probably olivine-rich basalt flows - cover an area of 113,000 square kilometers (43,000 square miles), or approximately four times larger than previously recognized. While the age of the Nili Fossae deposits is not known exactly, studies suggest they erupted about 3 billion years ago. Finding abundant, unweathered olivine in rocks and loose sediments that old says that little groundwater or surface water has touched the rock since it formed. Another study used THEMIS images to examine layers of olivine-rich lava exposed in canyon walls in Ares Vallis on the other side of Mars. Details suggest the Ares lavas flowed at various times throughout the formation of the upper crust of Mars. Thus these lavas have roughly the same age as the Nili Fossae basalts - and they likewise show little sign of alteration by water. As THEMIS surveys Mars, the planetary inventory of olivine-rich rocks continues to grow, suggesting these rocks may prove relatively common. If Mars has much olivine surviving largely unchanged for 3 billion years, then it hints the planet has been dry and cold for most of that time. Colors ranging from magenta to purple-blue map large exposures of olivine-rich rocks in the Nili Fossae region of Syrtis Major. THEMIS images show the olivine is about four times as extensive as scientists previously thought. This image is about 350 kilometers (220 miles) wide.